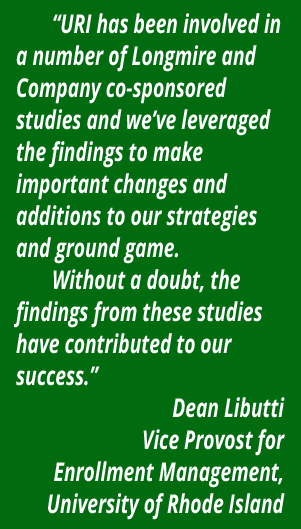 Our national higher education co-sponsored studies always yield new market intelligence that contribute to a college’s ability to grow and control enrollment. I think our newly-launched study will be the most important one to-date. I’m going to tell you why but first let me state the obvious. We know that prospective students don’t always tell us what they really think. Sometimes they don’t want to be completely honest because they think they’ll hurt our feelings. Or, they really just don’t care that much about us even though they tell us they do. This study is going to dive deeply into uncovering the things students hold back from colleges during the college shopping process and, more importantly, the findings will provide colleges with strategies and methods to uncover hidden influences and deal with them before the student solidifies his or her enrollment decision. If you’re thinking this looks like an admitted student survey, let me assure you it’s not. This study will delve into the psychology of the decision-making process and it’s going to influence the conversations and communication that colleges will have with prospective students in the future. So, why am I confident this new study is going to be a groundbreaker? I got a taste of what we will learn after conducting a series of focus groups with college-bound students who will enroll this fall (we often use qualitative research prior to developing the survey instrument used in the quantitative portion of the study). The focus groups proved to be particularly eye-opening and enlightening. We explored the facts, emotions, intentions and perceptions that students will and will not share with colleges during the recruiting cycle. We explored why students withhold information and we tested methods by which colleges can draw out and deal with these hidden influences on a student-by-student basis. These are the topics that the Hidden Influences study will explore in-depth. The focus groups revealed, for example, how students deflect the real reasons for not enrolling by attaching them to issues of high cost or lack of aid offered when, in fact, their enrollment decision was based on something entirely different. In those cases, the unsuspecting college is left to think their tuition and financial aid packages are not competitive when, in fact, it had nothing to do with the student’s final decision. During our focus group sessions students told us that colleges often overlook or don’t ask the types of questions that will provide a true picture of the student’s interest or attraction to the college. Students also said that colleges may ask a lot of questions but they don’t ask the right questions that will reveal the perceptions that will ultimately impact their enrollment decision. These are among the topics we’ll explore deeply in the study. The Hidden Influences study will provide co-sponsors with actionable data and insight to help them uncover and manage the perceptions and opinions prospective students have about their college. You should consider jumping on board this new study as a co-sponsor. That way, you’ll be able to get data and insight on what students are withholding about your college and, more importantly, learn how you can deal with it in the future. There is a long list of colleges across the country that regularly participate in Longmire and Company co-sponsored studies. They do so because they gain new insights about their prospective students and they make changes to their recruiting and communications as a result. 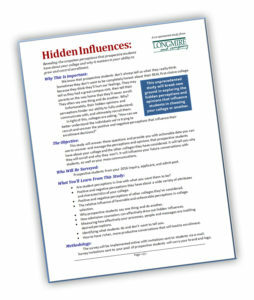 Getting involved in the Hidden Influences study is easy, low-cost, and provides valuable deliverables. There is still time for you to get on board and be among a growing list of public and private colleges nationwide that will benefit from this information. I encourage you to download a PDF that will give you all the information you need.